Aphids, white flies, slugs and other nasties can thrive in the hot house environment. You cannot put off dealing with them for a month or a season-they will not just go away if you ignore them! Pests and diseases don�t just happen. They are often a sign of nutrient imbalance (e.g., too much nitrogen), stress (imbalance of temperature, light or water), a plant past its prime, or a plant not suited to its spot or the season. 3) use organic deterant sprays (such as hot pepper, garlic) and organic pesticides only as a last resort. The most benign-the soap sprays-should be used first before employing pyrethrin, rotenone, etc. a) keep the mulch light (four inches or less), loose and clean; remove all old or fallen plant parts and weeds from the greenhouse. 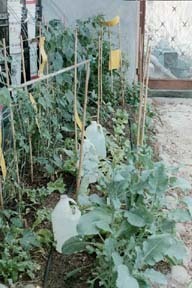 b) do not over water, especially in the winter when the greenhouse is closed, uses less water, and has a higher humidity. c) pull up plants past their prime. d) watch plants that are in poor health and pull them up if they don�t recover after a couple of foliar and soap sprays and continue to fail to grow as well as neighboring plants of the same type or variety. e) do not put diseased plants in the compost. f) keep the air moving with both ventilation fan(s) as well as circulating fan(s)-this also keeps air from stratifying. 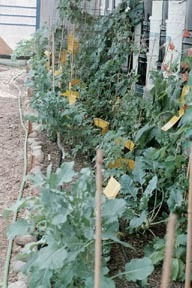 g) intercrop and rotate crops; monoculture in the greenhouse is unwise and boring. h) keep good records and don�t be afraid to try different and unusual varieties. Experimenting is fun. When I planted seven different heritage varieties of pole beans they turned out widely divergent in their growing habitats, health, insect resistance, and productivity. Find out what works for you. i) buy a good organic gardening greenhouse growing book with a section on pest identification and control. Try the trapping, baiting, use of predators and beneficials, vacuuming and repellant sprays they recommend. I did and the suggestions do work! 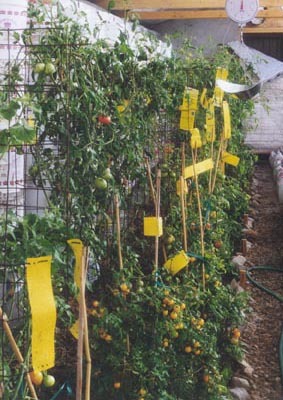 When I planted the tomatoes last year I didn�t start using sticky traps until a couple of months after I planted and the white flies got a foothold they never relinquished. This year I did more intercropping and put the traps up immediately. So far the white flies population is much less invasive.